Today Visual Studio 2012 RC (Release Candidate) came out. (It's 2012, so 11 make less sense than 2010+2) There's a lot of nice improvements for Web Development in this release candidate as we march towards a final release. Here's some of my favorite new features from the "Angle Brackets Team." That's my name for the Web Platform and Tools team. I hope it sticks. There's been some significant changes to the web optimization (minification and bundling) framework since beta. There wasn't enough control over what was bundled and in what order in the beta, so that's been moved into a BundleConfig.cs (or .vb) where you have total control, but everything just works out of the box. The API has been simplified and is slightly more fluent which means it's easier to read and easier to write. Also, bundles aren't bundled when you're in debug mode but are when released without you having to change your markup. The regular compilation flag in web.config controls it and you can certainly override with the BundleTable.EnableOptmizations property if you have specific needs. The best part is that you can plug in custom libraries. If you don't like the included minification technique or perhaps want to add your own, you can. Howard and the team showed me this small example to add support for LESS files and turn them into CSS as a transform, then minify the results. Then bundle up the *.less files and transform them as you like. Having good Templates is very important and we'll have even more additions and improvements to templates between now and the final release. Also, because the Web Team has externalized the templates (the web templates themselves are extensions that can be updated out of band) you can expect cool and useful updates even beyond the final release. The Web tends to move fast and we'd like to move fast as well. There's an Empty template introduced for ASP.NET MVC. Like really empty. Folks asked for it! The markup is cleaner in all templates and as before, is HTML5 by default. The ASP.NET Web Forms template includes support for the Web Optimization framework as mentioned above. ASP.NET Web Forms (like it or not, haters! ;) ) continues to share features with ASP.NET MVC because, as I've said before, it's all One ASP.NET. That means Routing, Providers, Model Binding, HTML5 support, Web Optimization and more are all features you can count on. They are part of ASP.NET no matter which framework you're choosing to use. Web API now includes scaffolding support (and Web Forms will soon as well) so you can easily make a CRUD (Create, Read, Update, Delete) API from your model. As with all scaffolding, you can customize it as you like. I also like that we're shipping Modernizr, Knockout, jQuery, jQuery validation and jQuery Mobile in our templates and you can bring it hundreds more with NuGet as you like. Take note, front end people. The team has looked at the complete experience from File | New Project, through development and debugging and tried to (and continues to tyy to) improve the "tiny cuts" that hurt you when developing web apps. Big new features are fun, but sometimes little features that fit into the middle of your workflow make life better and smooth the way. I like tiny happy features. If you pull the Debug menu down you'll see it finds all your browsers so you can not only use the one you like without hunting but also change your default quickly. Plus, they've added a Browse With menu to this pull down so ASP.NET MVC folks don't have to go digging for it in right-click context menus. If you select Browse With it'll bring up this familiar dialog. Now, try Ctrl-clicking on multiple browsers and click Browse. The toolbar will change so now you can startup more than one browser with one click, with with F5 or Ctrl-F5. 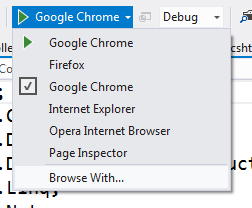 When you click it, you can select a specific browser for step-through debugging, then the other browser will launch as well. This is a small, but happy feature that I appreciate. If I type a hyphen (dash) in the CSS editor I get a smart list of all the vendor specific prefixes, even Opera! These lists include help text as well for properties which was no small amount of work. There's drop-downs and pickers for fonts and colors (my favorite) as well as a color picker. These are just a few bits of polish. There's lots of new snippets and expansions as well. You can also create profile specific transforms, i.e. web.Production.config, but we haven’t updated the tooling yet to create these. In this case if you have a profile specific transform we will execute the build config one first and then the profile one. HttpResponse.ClientDisconnectedToken: A CancellationToken that asynchronously notifies the application when a client has disconnected from the underlying web server. HttpRequest.TimedOutToken: A CancellationToken that asynchronously notifies the application when a request has run longer than the configured request timeout value. HttpContext.ThreadAbortOnTimeout: Allows applications to control the behavior of timed out requests. Defaults to true. When set to false ASP.NET will not Thread Abort the request but rather leave it to the application to end the request. Both ASP.NET MVC and ASP.NET Web API have had a number of improvements since Beta. We now use and support the open source Json.NET serializer for handling of JSON data. You now can easily build custom help and test pages for your web APIs by using the new IApiExplorer service to get a complete runtime description of your web APIs. ASP.NET Web API now provides light weight tracing infrastructure that makes it easy to integrate with existing logging solutions such as System.Diagnostics, ETW and third party logging frameworks. You can enable tracing by providing an ITraceWriter implementation and adding it to your web API configuration. 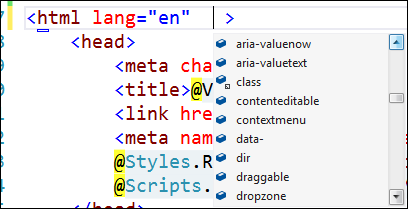 Use the ASP.NET Web API UrlHelper to generate links to related resources in the same application. 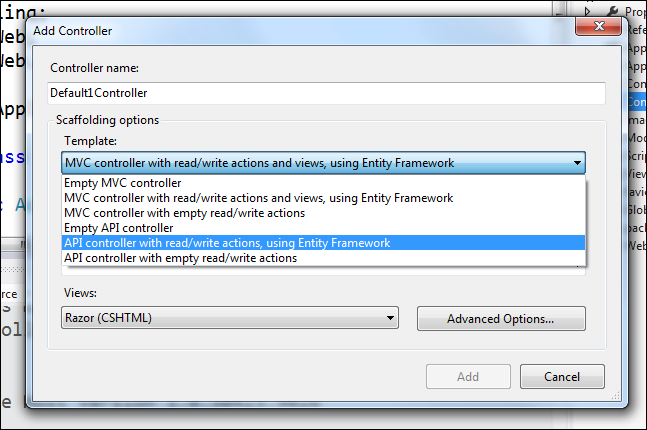 Use the Add Controller dialog to quickly scaffold a web API controller based on an Entity Framework based model type. Create a unit test project along with your Web API project to get started quickly writing unit tests for your Web API functionality. The configuration logic For MVC applications has been moved from Global.asax.cs to a set of static classes in the App_Start directory. Routes are registered in RouteConfig.cs. Global MVC filters are registered in FilterConfig.cs. Bundling and minification configuration now lives in BundleConfig.cs. Ah, the controversial theme change. They've added a bunch of splashes of color, brightened the background and made the status bar change color depending on your status. I'm not sure what I think about the ALL CAPS menus but I honestly don't look at them much. They seem to be the last thing that folks are freaking out about. My guess (I am NOT a designer) is that there's an implied horizontal rule along the top edge of the letters and if you used mixed case they'd just be floating words. We'll see what happens, maybe it'll be a option to change, maybe not. I'm more worried about the web functionality than the look of the menus. I think the RC looks way way better than the initial Beta, myself, and I understand there are more changes coming as well as clearer icons in the dark theme for the final release. You can read more and look at side by side examples and decide for yourself at the Visual Studio Blog. It's growing on me. I've even tried out the Dark Theme along with Rob's Wekeroad Ink theme from http://studiostyl.es. While I'm not sure if I'm ready to fully make the dark theme switch, it's pretty nice. Customization is back to make for a smaller installation. Install the RC directly over the Beta. No need to uninstall. Whew! XAML compiler incremental builds in Metro apps is now twice as fast as beta. Go-Live license, which means you can publish apps live today and get support if you need it. Be sure to go through the readme to make sure that there aren't known issues that might mess you up. As with all pre-release software, be careful. Test things and don't blindly install on systems you care about. I'm installing this "on the metal" but I'm keeping a Visual Studio 2010 SP1 virtual machine around just in case something obscure is discovered. One gotcha that I know of so far for those of you who are totally riding the beta train. If you install Visual Studio 2012 RC on Windows 8 Release Preview and are trying to get an ASP.NET 3.5 (that's 3.5, be aware) application to work, you'll have trouble with IIS Express. 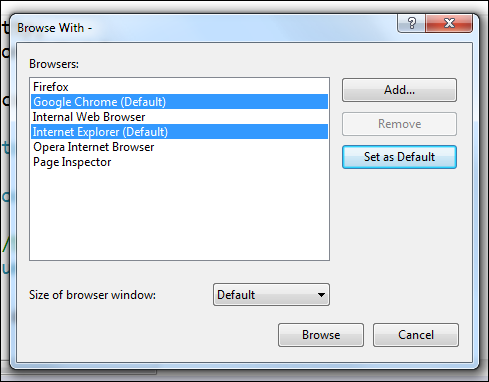 You can work around it by installing IIS8 from the Windows 8 Add Features control panel. Just installing IIS8 will fix a bad registry key created by IIS8 Express. This will be fixed in release. Obscure, but worth noting. What with the weird effect in the installer? When you agree to the terms, the window changes size Next button moves a bit down, as if they wanted to add another component before the Next button. But nothing else changes. THANKS FOR KEEPING THE ALL CAPS MENU IS THERE A COBOL ADD ON MODULE SO WE CAN TRULY ROCK IT LIKE IT IS 1982?? which makes me want to pull out my few remaining hairs. Can I turn this behavior off so that the curly brace remains on the line where I originally put it? This is a "tiny cuts" issue for me. What's the implications of installing over VS11 Beta, if any? If none, is there a simple way? Do you really -need- to shoehorn your personal preference for K&R braces style into the C# language which by default follows Allman style? Is this override really important to you? Give it some thought -- you might realise it's actually "okay" and you can leave it alone. It's Doing The Right Thing. It's not worth accumulating stress over. Hey Mike, I'm going to ask a stupid question just as a sanity check first because we _should_ be following your configured C# conventions. Did you make sure that the settings are configured the way you like them in 'Tools > Options > Text Editor > C# > Formatting > New Lines'? If they are set right, then we are doing something wrong. Send me an email (anurse at microsoft dot com) and we'll see if we can figure out what's going on. I've tried the "no uninstall" for the RC from beta on a Windows 7 machine and a Windows 2008 R2 VM, and both didn't seem to want to upgrade for some reason. "Modify" was disabled and "Repair" just repaired the Beta. Slightly baffled, but ended up just uninstalling and installing the RC afterwards. What is the term of the license like for the release candidate? 6 months, until Jan 1, 2013, etc? In mvc 4 beta above code always look for Site.css, is that fixed? Any updates to SPA template? I noticed that the SPA template is not an option anymore for an MVC application and that the Internet Template for Register and Login now take you to an actual page instead of using the JQuery UI popup dialog for authentication (AjaxLogin.js was removed). Is there a reason these features were removed? Will they be back in RTM or have they been pulled from the current release cycle? The "Microsoft.AspNet.Web.Optimization" RC package used in the new MVC4 template is not available on NuGet so I can't upgrade an existing project to use the new features described here.. Any suggestions? Wait, what? I'm so confused. What is VS 2012 RC? What is VS11 Beta? Why are they not named the same? What's the nu name? Does everyone else know but me, since it was not mentioned in the post at the beginning at all! "there's an implied horizontal rule along the top edge of the letters and if you used mixed case they'd just be floating words". If this is the main concern then the top part could use a slightly different background shade like Expression Blend which would give it a region and not float around. However, there are many other areas in the current design where things float: Properties, Solution Explorer, etc. tabs in the bottom right, the Toolbox or anything anchored in the left side, and open files (other than the current). I personally turn off all the toolbars and leave only the solution explorer. I would prefer if I could turn off / hide the main menu as well -- similar to how IE hides it. I very rarely use it, and if I could pin a few buttons next to the "quick launch" area I could gain one more row for code. This would be really sweet! 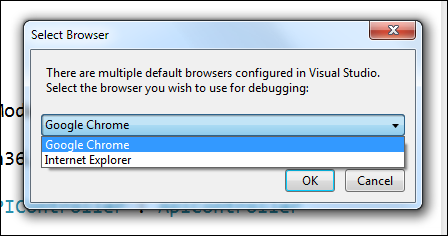 When debugging with Chrome or FF, does VS know that a browser window is closed, so that it would stop the debugging? You mention that dotnet 4.5 now works on Vista. Does it also now work on Windows Server 2003? I know it's old, but a client of mine has a SBS2003 server, and there's no easy upgrade path, plus it's working great... except we'd like to use some of the 4.5 features. You can turn off the ALL CAPS menus - How To Prevent Visual Studio 2012 ALL CAPS Menus! Installer keeps on crashing. repair is also not working. "•TemplateParser.ParseTemplate method that allows the application to generate an ITemplate instance from a string of ASPX markup"
Wow. I'm not doing web forms any more but if that's what I think it is that's some pretty powerful stuff. "•The configuration logic For MVC applications has been moved from Global.asax.cs to a set of static classes in the App_Start directory. Routes are registered in RouteConfig.cs. Global MVC filters are registered in FilterConfig.cs. Bundling and minification configuration now lives in BundleConfig.cs." Interesting. I might like that. Less clutter in Global.asax.cs. Nice blog post, as always. But Scott, please mention in the beginning that VS11 is now VS2012. I wonder why microsoft change the version of VS11 to VS12 over the night? any perticular reason behind this? Anyway lets see the VS'12. There is no mention of Asp.Net in VS 2012 express for Web. Why should I believe that Asp.net is still important to Microsoft? Scott, thanks for the heads-up. As usual a lovely post with great pointers. About VS11 vs Visual Studio 2012 RC: as with any other product VS11 was the '<a href=http://en.wikipedia.org/wiki/Microsoft_codenames">code name</a>', like we used to have Whidbey, Orcas, Whistler and Longhorn, Cairo (remember?) etc. They all evolved to actual products with real marketing names. That status bar background colour has to go. The window title bar is too tall too. can you run this side-by-side with vs2010 ultimate? Just a quick addition, as I ran into this today. For everyone confused with the "new" name.. It is still version 11. Just like VS2010 was version 10 and VS2008 was version 9. It just now has a real name, "2012". Look at your Program Files folder and you'll understand. 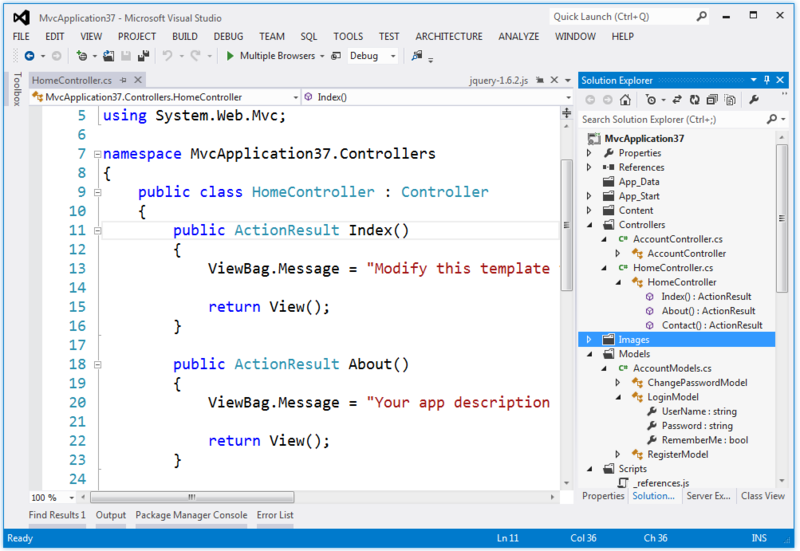 Great news , Great features, Visual Studio 11 works like a small OS within a Big powerful OS! Will there be a guide on how to update a beta MVC4 project to the RC? Because instead of just making new versions of the nuget packages, the package Id's have changes so it's apparently not as simple as just updating all the nuget packages in the project. In fact it says there are no updates except for EF5. lol @ the braces post. The intellisense additions to the web are extremely welcome, especially little touches like multiple browser selection etc. Not sure if I will dive in just yet, and does this version impose .Net 4.5 on you? Oh, and seriously, are some of you really getting confused about VS11 & VS2012...? Talk about nit-picking, jeez..
And it sais Ultimate 2012 RC when i downloaded professional. I will try to reinstall, but perhaps something someone should look into before RTM? Great work on the release. Reading at some comments, it looks like all the programmers are turned into UX experts overnight? Every one is suggesting some changes to design. Guys instead how about we make stuffs more better where it matters! For eg, CoffeeScript Intellisense, SASS Intellisense and helpers to write mixins etc, there are tons of constructive criticism that we can do. Let's do that instead of chagning case or putting colors and so forth. The new VS look is terrible. Use more colors! For example solution explorer without colours is confusing! SPA has been removed and move out of band so it can rev outside. It'll be available later as a NuGet package or extension. It's alive, just moved sideways. Amit - Just a typo. It's been fixed. >> Amit - Just a typo. It's been fixed. Thanks a lot Scott! I have Vista installed at home so I couldn't download and see it for myself. Also many blogs and articles have mentioned the same thing thats why I was worried. Thanks for replying urgently! Visual Studio 2012 is good except the terrible UI. It hurts eyes! After spending some minutes working on VS2012, I opened the solution in VS2012 again, ah, I had only one feeling: my eyes are very pleased, and I can easily find buttons, files, etc. Does solution round tripping work with MVC projects in 2012 RC? Scott, what's the story with MVC 4? Does this mean it's no longer "Beta"? And if so, when will a non-beta package be available via NuGet? Did the ~/ shortcut for Url.Content stop working? I upgraded and now I'm getting blank images in my site. Is it just me or is this wwwwwwaaaaayyyyy slower than the beta? Should be considerably faster. What's your disk? your hardware? video card? Hi Scott - it's on my laptop which isn't super spectacular but ran the beta pretty well. Intel HD 3000 Graphics Card. Machine generally runs pretty good. I ran the install over the beta rather than a fresh install if that makes a difference. Is it just me or anyone experienced the below problem? I have VS11 beta on my laptop. Downloaded VS2012 Professional RC from MSDN downloads and installed. Installation was successful but when I launch the application it opens as "Ultimate 2012 RC" ..Invalid Licence Data..Reinstall is required. This morning I installed VS2012 Prof RC on office PC which has no VS2011 Beta installed. VS 2012 launches correctly and works fine. Scott says VS12 RC can be installed on top of VS11 Beta. What's wrong with the installation on my laptop? @reddy - I have experienced that since the beta, but only if I click a project in the Jump List on the start bar. If I start VS directly and then open the project, no problem..
How do i change the color of the bright colored status bar at the bottom (found out how to remove it, but i want to keep it)? It is to bright and sticks out to much. How do you use the minification and bundle feature with a CDN? Last but not least, if you have BuildViews set to true in the project file for a MVC project, the publish feature don't work without having to manually clean the project every single time, and making sure not going to the preview tab (which will make it compile to compare with the server). It is very annoying and the bug was also in VS 2010. I also get the Invalid License Data error. Are the any way to fix this? the intent is to reduce focus on menus, and increase focus on the code which I think is one of the big goals here, isn't it? I just installed the RC and it looks great but I already ran into an issue. I created an Empty Web Project and I am trying to add BundleConfig to it but I cannot find System.Web.Optimization to add a reference to it. Hi Scott, is this RC build supposed to be compatible with working on Azure projects? In previous builds we saw "At this time, Visual Studio 11 Developer Preview does not support Windows Azure Tools for Visual Studio." So we've stuck to VS2010 up to now. Thanks! Is it not up to date? Great work, Microsoft! I've been using it for just under 10 minutes and my eyes are already bleeding. Thanks for getting rid of all the colors that I use to differentiate the icons, menus, etc. The CAPSLOCK for the menu is also a nice touch, especially since .Net naming conventions (Stylecop) say caps are bad; even for constants. For my next web project, I'm going to hire a bunch of YouTube commenters for my website UI. Ok, I am always afraid to uninstall visual studio and this time there was a mess of some VS2010 stuff (which probably were installed with VS2011 beta), VS2011 beta and VS2012 RC - you never know if you do it in the right order. This time I simply uninstalled VS2012RC and then VS2011 beta and left the rest behind. Then I installed VS2012RC again. It complained about some C++ library that didn't install properly, but it seems to work now. On a further note, I tried uninstalling all extensions and it didn't make any difference. Nice gift for Children's day! The default implementation of bundles in vs2010 using the mvc4 rc, doesnt appear to work for me. if (like in the beta) i create a new mvc4 internet app, add a entity diagram, add a dbcontext, then decorate a emailaddress with the appropriate annotation. build, scaffold a controller etc. when i fire up the app and go to the page if only validates after postback rather then on lost focus of the textbox. f12 on chrome tells me ther are 2 uncaught script errors, for jquery.validate.min.js and jquery.validate.unobtrusive.min.js. if i comment out the two @scripts.render lines and paste in some direct calls to the relevant libraries it works. guessing there is some configuration missing from the bundle setup by default? Tim - I think you need a newer jQuery to validate against HTML5 types. I'll ask. K4gdw - use the feedback tool to send a report with details and also email me. I'll follow up. Should be faster. I posted on the the VS blog when they first announced it that I loved the new features and liked the glyphs but hated the color scheme. I posted again when they announced the slight touches of color that it was a huge relief. I think that the team should realize that they are getting so much feedback about the UI because honestly, the rest is awesome. I'm sold on the UI now, and have always been sold on the features. Cannot wait till I can start using this on work projects regularly! Four versions of Visual Studio, again? I hoped that for '12 that would have been streamlined into two, paid and free. Hi! First of all, I wanted to say that I like the new look, appreciate the fact that feedback was incorporated in the changes, and don't feel the need to change anything (some people should please stop whining). While looking through the new API for the Bundling, it was nice to see how it has become simpler and more intuitive. I did want to ask if there would be more documentation about it, as there is none at the moment. Just to understand little things, like why the dependence on WebGrease (what value is it providing) and what is the Instrumentation Mode used for (and why is it depending on the Eureka UserAgent)? Is anyone else having trouble with URL resolution using the ~/ syntax? This worked perfectly in the beta and immediately after the upgrade to RC stopped working. How about the keep-editing-while-compiling feature? Did I see that in a dream or is it simply out of scope of this post? Is there timeframe for SPA? ... http://www.asp.net/single-page-application says see the Codeplex site and Codeplex says to see http://www.asp.net/single-page-application. Its a circular reference. Anyone figured out how to do this with the RC? I have tried to import a theme like http://studiostyl.es/schemes/vs-11-black-theme this but i can't get rid of a stupid white border around the selected line in the code window. Has anyone found it possible to hide or "de-color" the status bar? I can't look at code for more than a minute without my eye being pulled to the bright blue area telling me that visual studio is "Ready." Yes, You're still ready. Thanks, vstudio. 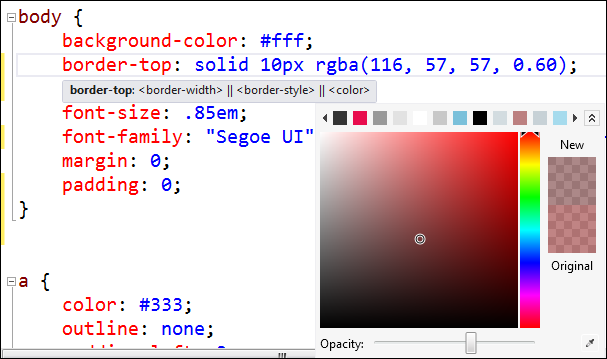 VS2012 has very little color, so that color demands attention. Ask them to use it well, or better yet - ALLOW US TO CHANGE IT. I'm curious (and a bit disappointed) why no progress has been made to provide intellisense and color coding for T4. There are a couple of extensions available to help in this area but I don't understand why support for this isn't baked right in. Do you have any insight on this, Scott? The whole dark theme change is pretty neat! @itsyehuda.myopenid.com There shouldn't have been any breaking changes to "~/" syntax. Can you send me an email (anurse@microsoft.com) with more details? I haven't read through all the comments yet but, here is my experience. I started with a Windows Server 8 beta (Hyper VM) install with VS11 beta installed. "The .Net Framework installed on this machine does not meet the minimum required version: 4.5.50501." I noted your comment, reinstalled VS11, ran VS2012 RC again, same result. I have a Windows 8 beta VM also with VS11 beta installed, I'll try to run the RC on it tomorrow. Matt Johnson, one of the developers on the Visual Studio team, developed and released a theme editor extension for Visual Studio 2010 on Studio Gallery. His tool needs additional time and effort to work with Visual Studio 2012 given all the changes we made. As soon as it’s ready we will make it available. With Matt's tool you will be able make a wide variety of theme changes including updating the Status Bar colors to colors of your choosing. Create new WPF Application (4 or 4.5 framework) project. Open said WPF Application project in Blend for VS2012 RC. I get no Design view whatsoever. One Important feature VS team missed is Zoom option. If I increase page ZOOM (say 130%) VS should presist zoon level for new and open window. Are the new publishing options going to replace the add-on Web Deployment Projects that we had in previous versions of VS, or will there be a Web Deployment Project for VS2012 once it goes RTM? Just curious because I see that my Web Deployment projects from VS2010 projects are not supported in VS2012. Looks nice; shame we'll never be able to use it. We have several .NET 4.0 applications running on XP and 2003, so if we install 4.5, we can't maintain those applications any more. Even if we target 4.0, we'll still get the 4.5 bug-fixes on the dev box, which aren't available on the live systems. And yes, I've heard the arguments that XP is ten years out of date; that doesn't mean that our customers can suddenly magic-up the funds and time to upgrade all their computers to the latest version overnight. Richard, nobody is suggesting that they upgrade from XP over night. I would suggest that as of Vista, it was obvious that this day would come. I just can't have too much sympathy for organizations which waited until now to upgrade. The writing has been on the wall for six years. To get rid of the white border around the selected line in the code window, go into Tools > Options > Expand Text Editor > Select General > Under Display > Uncheck "Highlight current line"
Yeah, that was driving me batty as well. @John: The writing may have been on the wall for six years, but Microsoft is still supporting XP until April 2014, and .NET 4.0 supports XP. If we'd known two years ago that .NET 4.0 wouldn't be supported on XP/2003, then we'd have stuck with 3.5; as it is, XP and 2003 were supported, so we made the mistake of using 4.0 in the belief that it would continue to be supported on those systems. I'd love to be able to drop support for older OSs, but one of the projects in question is for a government department. By the time they've upgraded to Windows 7, we'll be on .NET 9.7 SP3 and VS19R2, which won't support anything earlier than Windows XV SP7! The existing project finally loaded. For my specific simple MVC 3 project, it runs ok without problem. I havn't got chance to load other complicated projects, not sure whether they are still working. Could not load type 'System.Web.Http.RouteParameter' from assembly 'System.Web.Http, Version=4.0.0.0,Culture=neutral, PublicKeyToken=31bf3856ad364e35'. is it 2012 RC version still under process . can you please post a sample of what worked in Beta but does not work in RC? I just installed the RC for the first time. I love the new "EMO-Despair" theme in either dark gray and light gray or light gray and dark gray. I am going to take it a step further and request that my employer remove all traces of color and joy from the rest of my working environment. No more green plants, red exit signs. Lets go for grey carpet, grey walls, grey ceilings, so as not to be distracted. And how about the distracting road signs - distracting red,yellow,green traffic lights, distracting yellow warnings signs, blue hospital signs green street signs - lets turn them all grey. And UPPERCASE. But Seriously! Please provide a skin to bring back something like the VS2010 style. IMHO it was the best look and feel ever - just the right amount of subtle color and style to provide context and orientation. The vs UI has improved steadily over the years until now. Please get someone besides Voldamort to design your UI or at least provide an alternative. I know its not the most important thing in the world, but c'mon. I spend too many of my waking hours in front of VS and I am not looking forward to it bleeding the joy from my existence. Scott - any idea when the Recipe functionality will be released? It was in the beta, but dropped out of the RC. The docs say it will be released on the side. We were using that feature and would love to know when we can get it back somehow. Thanks! When you upgrade to Visual Studio 2012 RC, the Windows SDK and LocalEspC files that were installed with Visual Studio 11 Beta are not removed and are not upgraded. Whats about LessTransform with debug = false : <compilation debug="false" targetFramework="4.0"/>. My Files are all empty! With Debug = true it is ok. The Bundle is transformed. On my local machine the less bundle is ok and has content. But on the Webserver (Azure) the less bundle is empty and does not have a token!? Its like "less?v=" thats all. Whats wrong? If you like the Current line highlighting, change the foreground to automatic for "Highlight Current Line" in fonts and colors. That will keep your highlighting but get rid of the horrible white border for those of us that use inverted color schemes. Not sure making the menu all caps makes me concentrate any harder on the code. I mean, was anyone really staring at the menu to begin with? Menus have been non-all-caps for 15+ years, and now I'm not expected to be focusing on an all caps menu? Not sure the intent meshes with the result. Will a Web-Deployment package be made avail for 2012 as was the case with 2010 (< a href="http://www.microsoft.com/downloads/details.aspx?FamilyID=89f2c4f5-5d3a-49b6-bcad-f776c6edfa63&displaylang=en" target="_blank">as available here</a>)? @Johan Van Dyk, did you find an answer to your question? I too hope that they push out web deployment project support with VS2012. Hi Scott, i've got the same problem like k4gdw. Installed VS2012 and now both Visual Studios 2012 and 2010 are extremely slow. Worst thing, debugging is now 10times slower on ASP.NET WebForms than before. Same Project/same Hardware without .NET 4.5 installed lightning fast. I tried a lot of debug tweaks with symbols etc, checked Windows Event Log, etc. Nothing points me to a problem. Event Tracing in config, Stack Trace, everything seems normal. Any Idea how to pinpoint the speed issues? I have just uninstalled, VS2011 beta, and installed VS2012. I have opened up an ASP WEB API project I have been working on for several months under the beta. I am getting errors relating to System.json. First of all, the dll is gone. It is in the BIN directory of my old project, but when I open the project in 2012 it is no longer there, and the reference is now marked broken. In fact the number of dlls in my bin dir has been reduced by half (whats up with that?). If I go to add System.Json in NUGET.. first of all it tells me that it's installed (What?)... so I go and remove it from the package.xml and install it. Everything compiles, but when I run the website I get errors in Global.asax telling me the Newtonsoft JSon 4.5 has not been installed? I have not upgraded this project to net 4.5.. so I don't get where this is coming from. Never the less, I loaded Newtonsoft Json from NUGET, and then everything runs... however all my ajax calls from jquery back to controllers are now broken. The POSTS (i only have posts right now) no longer find their controller methods. I was able to fix one call by packaging the parameter in a user object (as opposed to a parameter list) and then it worked... but then all my returning json objects (that use system.json) are now empty! The structure is there but they have no content. The lack of borders and "container clues" (for lack of a better name). Is extremely distracting. I didn't even realize they were missing until they were gone -- very hard to distinguish between the editor window and a tool window and a menu. 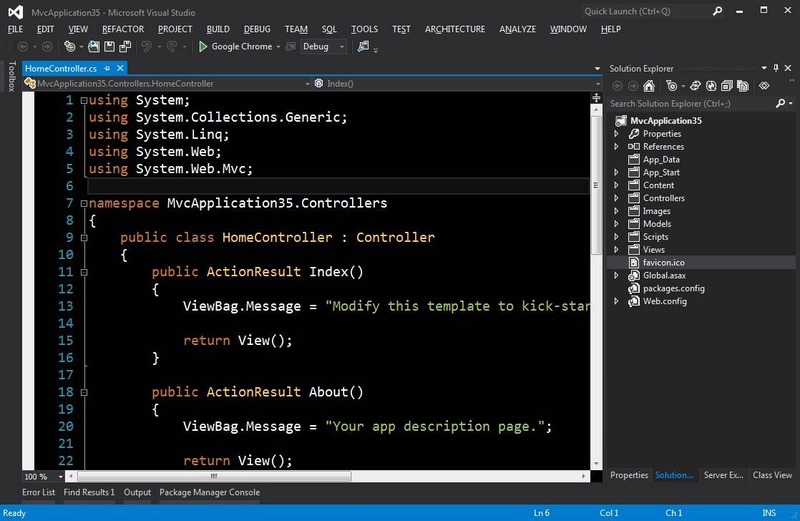 I know that VS 2012 represents a lot of hard work, and I LOVE some of the new features, but the lack of color and "regions?" "containers??" "borders??" make it both harder to use and very unengaging to work with all the way around. UI: Can you maybe release an update pack or something? I THINK I'M GOING TO START CODING IN ALL CAPS. FEELS KIND OF RETRO. It is a shame sometimes that so many old Hanselman posts get so much Google SEO juice that they keep coming up on the first page of search results even though the information is out of date. Bundling and minification in the final release work *not at all* like they are described in this post. I know this page is all about the Release Candidate and of course things change when released...in this case they changed quite a bit. When you read here that "everything just works out of the box" you will be in for a rude awakening when you try to get it working. It would be worth putting a disclaimer at the top of the page similar to what you did on some other posts in the past. when i'm right clicking the solution explorer for setting multiple startup, it throws object reference error. Why is Microsoft making offline registration so darn difficult? I don't have Internet connection on my work computer. Other companies, such as NativeInstruments, make it a breeze. It's a real shame. Microsoft is sending me form site to site and I end up running around in circles with no outcome. In my comment I was referring to Express 2012 Web and Desktop. John. Is there any way to make Less bundles work with optimization disabled without use any http handlers? Some kind of simple less bundle transform without configuration in web config and any handlers that works without minification enabled. By mistake I hit some key and now the word " Main ()" suffixed to Sub is remain hidden from my Visual Basic Studio 2012 Module. I tried to retrieve it but of no luck. This had happened while I was on Tools for some other job. I would be grateful, if you could let me know of its solution.